Our most effective hair vitamin supplement! Vitamin, mineral and protein complex combined with "essential" amino acids, and powerful Zinc, Biotin and Chlorophyll! No yeast. No sugar. Great for skin and nails, too! Follicleanse – Great Hair…Healthy Scalp. USE AS DIRECTED: One capsule in the morning with a meal. One capsule in the evening with a meal. Available in 1, 3, and 6-month supply! If you're looking for enhanced strength or want to improve shine and sheen to dull or drab hair, Follicleanse Hair Vitamins may be your answer. Developed and formulated over years of research and studies, Follicleanse Hair Vitamins is packed with nutrition shown to be key components towards beautiful, smooth, shiny hair! It's no secret that nutrition plays a key role in your hair's health...and, the proper balance of vitamins and minerals can provide the nutrition that makes you and your hair look and feel great! For many of us, slow growing hair or breaking - even frizz - often comes from some component of vitamins, minerals or amino acids lacking in our diets.These deficiencies can be the result of our diets, but often are the result of several other factors such as rapid or quick changes in weight, temporary hormonal imbalances, growth spurts, and even chemical treatments that may affect your hair or scalp. Follicleanse hair vitamins builds upon a solid base of key vitamins - Biotin, Niacin, and B-12 - then combines nutrient-rich chlorophyll that also helps promote added nutrients.Add key minerals and "essential amino acids" and you get the perfect combination of balanced nutrition. Take twice per day. One in the morning with a meal and one in the evening with a meal. I just started taken these vitamins, and would like to come back in a few weeks to give another review. I have been using the vitamins for two weeks now and I’m already starting to see a result. I would continue to use these vitamins. 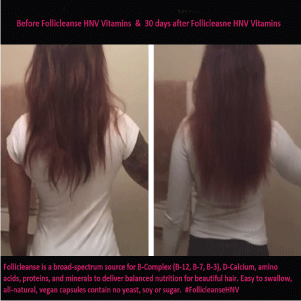 Well, I've been taking Follicleanse HNV Hair vitamins for about 2 weeks. I haven't really done anything to my hair, so I don't notice a huge difference. But the one thing I notice is that my hair feels thicker. I think I'll have to finish the bottle before I can say that I've noticed a significant difference.